Holly, Ivy and Mistletoe are seen growing wild in the Irish countryside. They were originally used in pre-Christian times to help celebrate the Winter Solstice Festival, to ward off evil spirits and to celebrate new growth. When Christianity came into Western Europe, some people wanted to keep the greenery and to give it Christian meanings. The United Kingdom and Germany were the main countries to keep the use of the greenery. The Christian meaning of holly, with it's prickly leaves, represents the crown of thorns that Jesus wore when he was crucified. The berries are the drops of blood that were shed by Jesus because of the thorns. 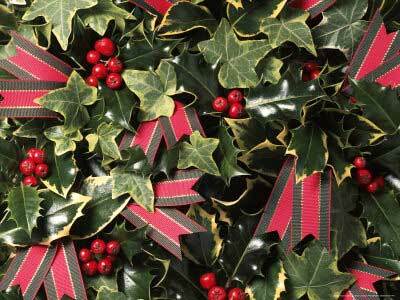 In pagan times, holly was thought to be a male plant and ivy a female plant. An old tradition from the Midlands of England says that whatever one brought into the house first over winter, tells you whether the man or woman of the house would rule that year. But it was unlucky to bring either into a house before Christmas Eve. Ivy has to cling to something to support itself as it grows. It's Christian meaning reminds us that we need to cling to God for support in our lives. Mistletoe is a plant that grows on willow and apple trees. The practice of hanging it in the house goes back to the times of the ancient Druids. It is supposed to possess mystical powers which bring good luck to the household and ward off evil spirits. 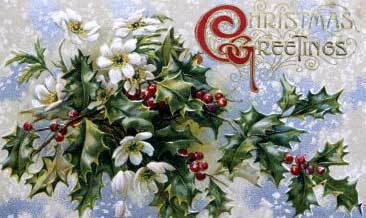 It was also used as a sign of love and friendship, and the custom of kissing under mistletoe comes from England. The original custom was that a berry was picked from the sprig of mistletoe before the person could be kissed and when all the berries had gone, there could be no more kissing. When the first Christians came to Western Europe, some tried to ban the use of mistletoe as a decoration in churches, but many still continued to use it. York Minster Church in the United Kingdom used to hold a special Mistletoe Service in the winter, where wrong doers in the city of York could come and be pardoned. 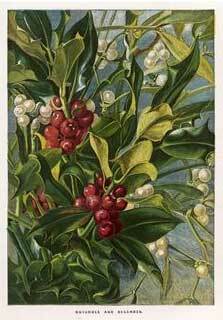 The name mistletoe comes from two Anglo Saxon words 'Mistel', which means dung, and 'tan', which means twig or stick. So the literal translation of mistletoe brings a rather unsavory image to mind, and about as far away from romantic as you can get.